THE ISSUE: Darth Vader leads an attack on the aquatic planet of Mon Cala, home of the future Admiral Ackbar. WHY IT’S EPIC: Machines and water don’t mix. 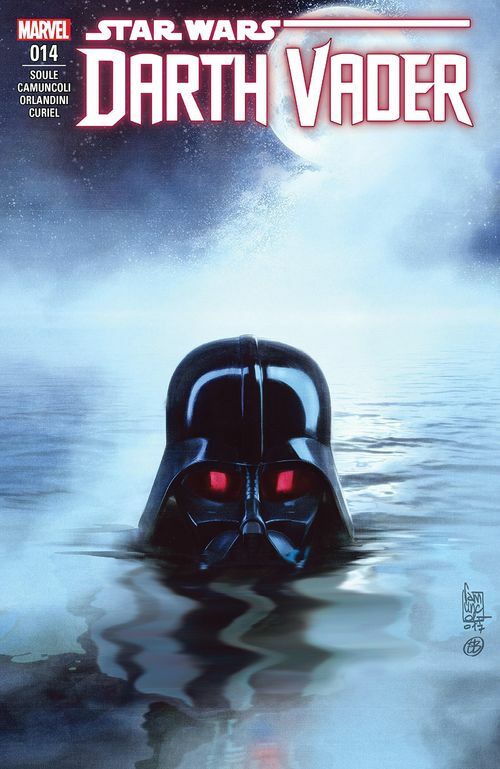 Darth Vader is famously “more machine now than man.” As we’ve never seen Vader in an underwater scenario (at least not in the movies), this cover is instant intrigue. 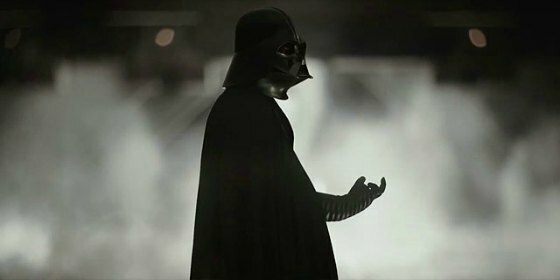 Apparently Vader’s suit is waterproof, so he doesn’t short out. But how does that work with his breathing? This cover’s unsung hero is painter Elia Bonetti. Camuncoli gets the top billing, and even the sole credit in some places. But with due respect, Bonetti is the star here. Without her, you’ve got a completely different texture. Look at the water and the accompanying mist. Look at the moonlight, and how it reflects off both the water and Vader himself. Simply put, it’s beautiful work. The red eyes are what really seal the deal. They pierce, intimidate, and bring life to the whole shot. 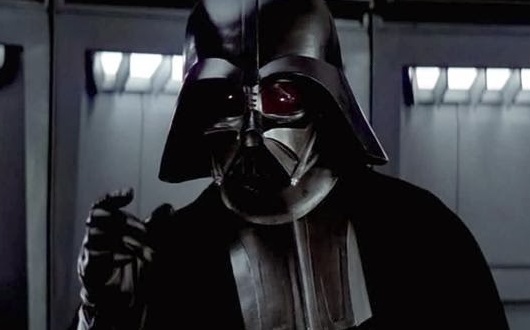 It’s kind of a cute little nod to the faint red tinge the Darth Vader lenses had in the original film. It wasn’t even that noticeable, and they were gone in Empire and Jedi. But the costumers for Rogue One brought them back to be consistent with A New Hope. The movie still sucked. But cheer up, guys! They got Darth Vader’s eyes right! This entry was posted in Comic Books/Graphic Novels, Epic Covers and tagged Admiral Ackbar, Darth Vader, Darth Vader #14 (2018), Darth Vader (Marvel Series), Darth Vader red eyes, Darth Vader: Dark Lord of the Sith, Elia Bonetti, Epic Covers, Giuseppe Camuncoli, Marvel, Mon Cala, Rob Siebert, Rogue One: A Star Wars Story, Star Wars, Star Wars: Episode IV - A New Hope on 04/26/2018 by primaryignition. STARRING: Felicity Jones, Diego Luna, Ben Mendelsohn, Donnie Yen, Forest Whitaker. It was pretty obvious from the get-go that Rogue One was going to be a different kind of Star Wars movie. Less a space fantasy, more ground-level combat flick. A movie that puts the war in Star Wars. If we’re going to have one of these movies a year for the foreseeable future, the franchise needs to expand its boundaries. So different is fine. 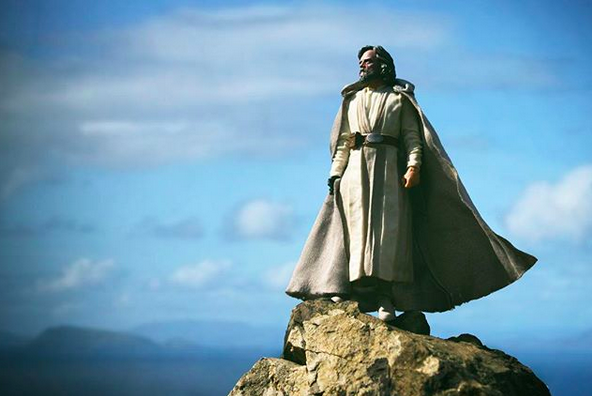 But what we get here is something that simultaneously does and does not feel like the Star Wars we know. That’s a double-edged sword. Or perhaps a double-bladed lightsaber. Rogue One tells the story of how the Rebel Alliance steals the Death Star plans before the events of A New Hope. Our main character is Jyn Erso, whose long lost father develops the plans for the battle station. 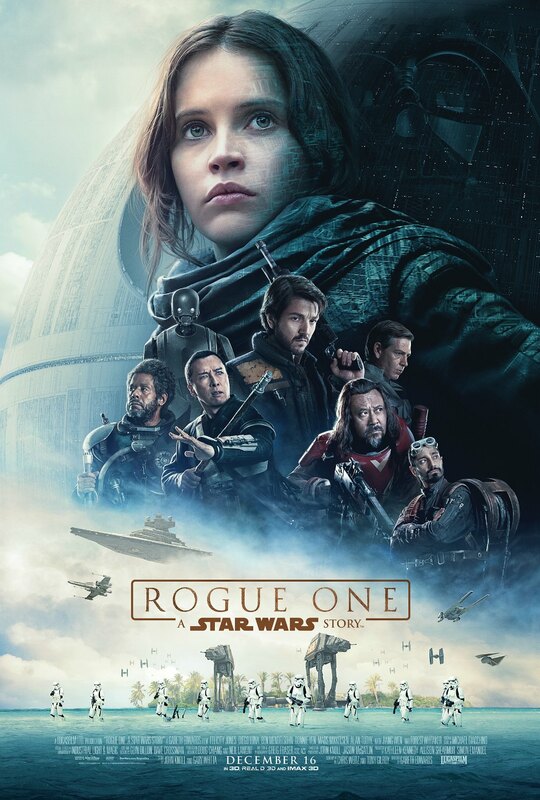 She is recruited by the Rebellion’s Captain Cassian Andor (Diego Luna) to help locate her father, who has long been forced into service by the Empire. 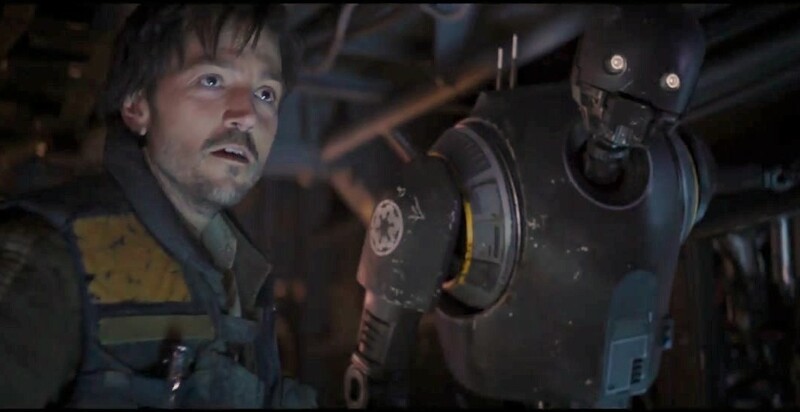 Along for the ride are Andor’s droid K-2S0 (voiced by Alan Tudyk), defected Imperial pilot Bodhi Rook (Riz Ahmed), blind warrior monk Chirrut Imwe (Donnie Yen), and mercenary Baze Malbus (Jiang Wen). Together, this small band of rebels will win a crucial victory against the Empire. But the cost will be great. That all sound vaguely familiar? It should. Like The Force Awakens last year, Rogue One is in many ways a love letter to the original 1977 Star Wars film, and there are plenty of parallels to draw. In addition to the obvious characters and imagery, Rogue One is peppered with little details, cameos, and callbacks to firmly plant it in A New Hope territory. Certain shots from the film are even mimicked once we get inside the Death Star. The plot also has numerous parallels. Our rebels sneak into enemy territory to sabotage the Empire, they dress in Imperial uniforms, there’s a droid (K-2SO in this case) manipulating things from a control room, we get a big space battle, etc. Rogue One is definitely a retro movie just as The Force Awakens was, albeit with a darker tone. But that darker tone doesn’t necessarily help things. 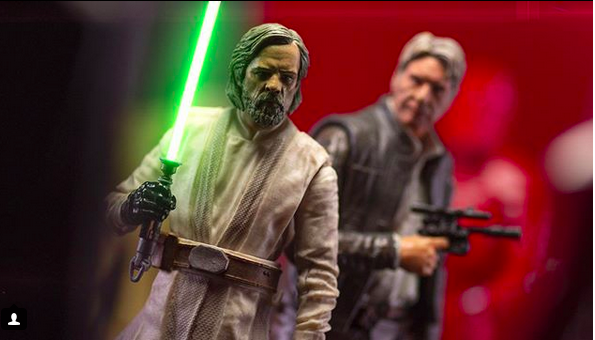 For so many years, a subgroup of Star Wars geeks have lamented some of the lighter elements in the movies (the Ewoks come to mind), longing for the series to focus more on the serious, dramatic, and dare I say cool side of things. To an extent, Rogue One does just that. 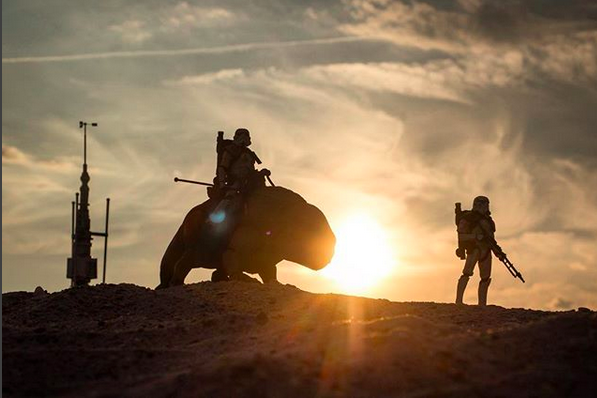 It feels like a Platoon or Saving Private Ryan sort of movie with Star Wars stuff pasted on to it. The movie misses that sense of awe and wonder that helped make the original trilogy (and even the prequel trilogy) distinct and special. There’s nothing wrong with expanding your boundaries. But you’ve also got to remember what universe you’re in. What’s more, these characters aren’t exactly the most memorable the franchise has produced. We understand their motivations and what drives them. But once you get past that, they’re not particularly likable or distinct. Our ensemble consists of about six people, so there’s not a lot of room for little personal moments where we get to know them as people. Case in point: Han and Leia arguing in the early minutes of The Empire Strikes Back. Or Obi-Wan talking to Luke about his father in A New Hope. 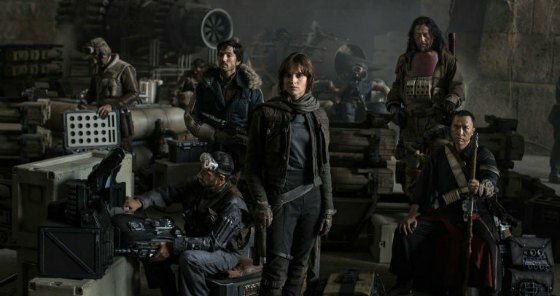 When it comes to our main character, Jyn, we know what happened to her when she was a child, and we get some vague information about what she’s done as a teenager and a young adult. But outside of her starting the story as a cynic, there’s not much to her. Ironically, the most charming character in the movie is the K-2SO, who isn’t even human. He’s got an Alfred Pennyworth, sarcastic butler thing going for him. Forest Whitaker’s character, Saw Gerrera, is the leader of an extremist group, and Jyn’s adopted father. His body is largely mechanical, and he needs the aid of a respirator. 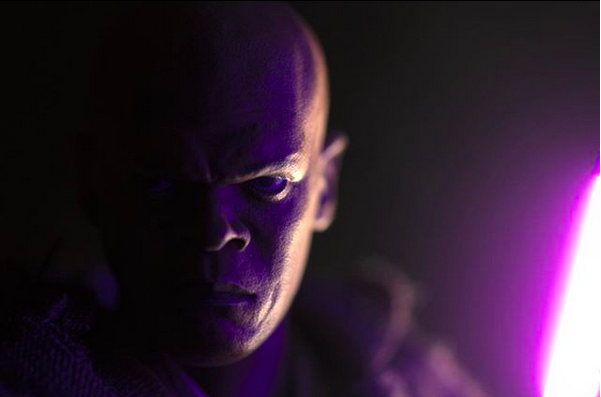 His dynamic with Jyn might have been interesting to explore as the movie progressed, but he’s only in the first half. Chirrut Imwe is fairly interesting. But again, we know so little about him. Because our main characters are fairly blasé, the classic Star Wars elements wind up serving as nostalgia boosters to keep us interested. Instead of being riveted by the story that’s unfolding, we’re looking at the stuff we recognize from that amazing movie from 40 years ago. It’s a nice recipe for warm fuzzies. Especially when we see some familiar Rebel faces, both at the base and in the space battle, two of which are played by actors from the prequels. In a perfect world, those nostalgia elements should be the garnish on top of an already compelling movie. But consider this: How appealing is Rogue One if you scale back Darth Vader’s involvement, and pluck out a few of those familiar faces? This is the first Star Wars movie that doesn’t have a John Williams score, which means Michael Giacchino has one of the most unenviable jobs in cinematic history. Imagine having to not only follow John Williams, but follow up on arguably his most iconic work. To his credit though, Giacchino pulls it off. He still has the classic Williams songs to work with, of course. But what he produces still feels authentic to the Star Wars universe. That’s a hell of an achievement, all things considered. Peter Cushing returns to the role of Governor Tarkin in this movie. That was unexpected, considering he died in 1994. But through the magic of CGI, and the voice talents of Guy Henry, he’s back. It mostly works fine. Though I’d be curious to know what those who were close to Cushing think about this little trick. 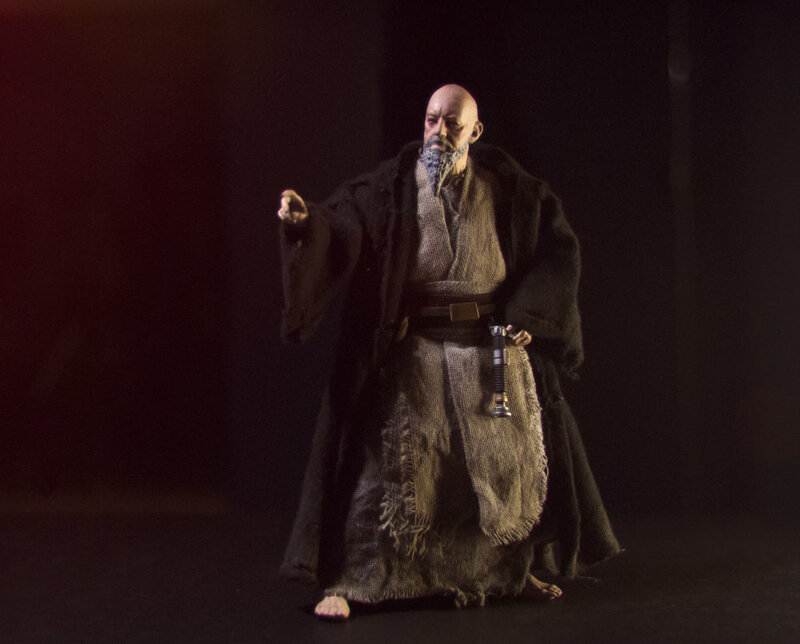 Also, does this mean the door is open for Alec Guinness to “return” as Obi-Wan Kenobi in future movies? Rogue One makes for a decent viewing experience, with a lot of the bells and whistles we’ve come to expect from Star Wars. 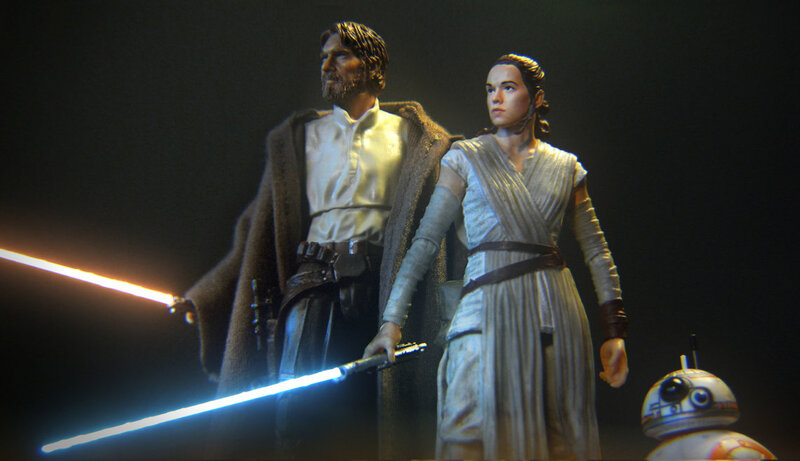 If you needed proof that the Star Wars Anthology idea can work from a creative standpoint, you now have it. But it may be the worst Star Wars film in terms of holding up to repeated viewings. All the best stuff in this movie was in A New Hope first. So given the choice, why not just watch A New Hope? This entry was posted in Movies and tagged Alan Tudyk, Ben Mendelsohn, Cassian Andor, Darth Vader, Death Star, Diego Luna, Donnie Yen, Empire, Felicity Jones, Forest Whitaker, Gareth Edwards, Grand Moff Tarkin, James Earl Jones, Jiang Wen, Jyn Erso, K-2SO, Lucasfilm Ltd, Michael Giacchino, movie reviews, Movies, Peter Cushing, PG-13, Rebel Alliance, Rogue One review, Rogue One: A Star Wars Story, Star Wars, Star Wars Anthology, Star Wars movies, Star Wars: Episode IV - A New Hope, Stormtroopers (Star Wars), Walt Disney Pictures, war movies on 12/17/2016 by primaryignition.